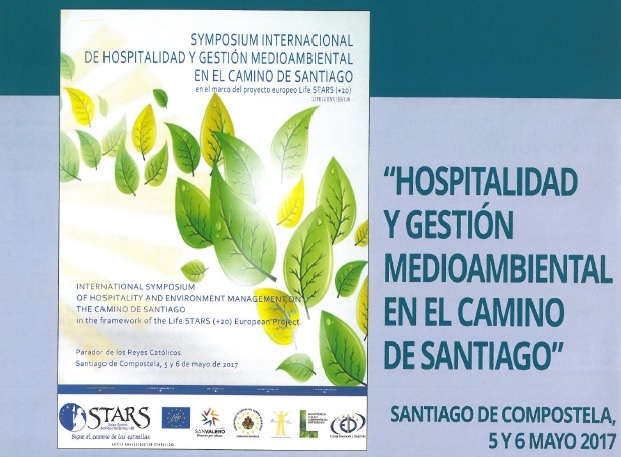 Santiago de Compostela will host the INTERNATIONAL SYMPOSIUM ON HOSPITALITY AND ENVIRONMENTAL MANAGEMENT ON THE WAY OF ST. JAMES, to be held 5 and 6 May 2017. While these two topics may not appear to be related, they are in fact complementary. The European project LifeStars +20, which was developed with the participation of the Spanish Federation of Friends of the Camino de Santiago Associations (FEAACS), is nearing completion. And as is always the case on such occasions, this offers an opportunity to assess what was invested, what was achieved and what can be planned for the future. What does hospitality have to do with environmental management? The project’s ‘area of action’ was the Way of St. James, specifically the French Route, and even more specifically, five hostels on this route: Arrés in Aragón, Zabaldika in Navarre, Nájera in La Rioja, Ponferrada in Castile-León and Samos in Galicia. All of these hostels are staffed by volunteer hospitaleros, who are managed by the federation. The symposium seeks to establish connections between issues around the environment, essential for the conservation of our planet, and hospitality, which has always been a part of the Way of St. James. There will be lectures directly related to the environment, with an emphasis on saving energy, as well as those directly related to the project. In addition, there will be discussion of the future role each one of us is prepared to take on after hearing from such authoritative speakers as Joaquín Araujo, Mª José Parejo and Antonio Quesada.